Of 173 breeds in the UK for which there are data, the status of 66% (115 breeds) is "critical", the FAO's highest risk category for domestic animal breeds. Another 27% (47 breeds) are "endangered", and 2% (4 breeds) are "vulnerable". Only 7 breeds (4%) could be classified as "not at risk". The reasons for the high proportion of breeds at risk are low numbers of breeding animals and an inadequate number of sires used for breeding. 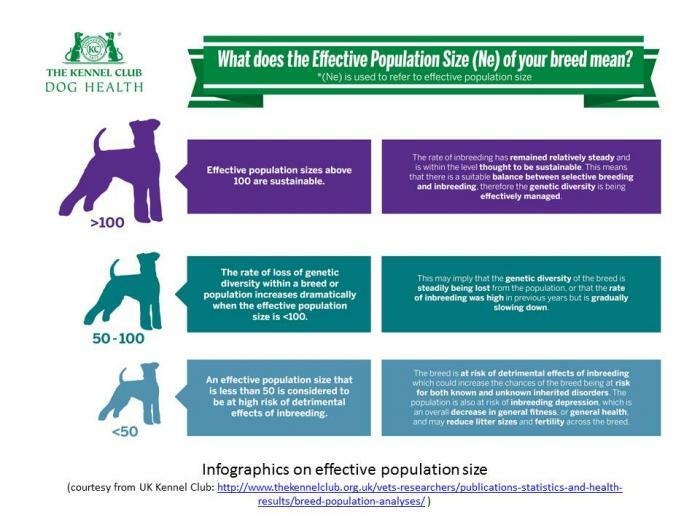 Comparable information is desperately needed for breed populations in other countries as well as the overall size and status of the global population. When the UK Kennel published their list of native breeds at risk of extinction, it made the headlines. "The disappearing dogs: Ex-popular pedigrees face extinction as fashionable pets take over", announced one news source, and from the BBC it was "UK native dog breeds 'at risk of extinction'". ​On the list were both well-known breeds like the English Setter, Bloodhound, and Mastiff, and less familiar breeds such as the Dandie Dinmont Terrier, Otterhound, and Skye Terrier. The most recent list includes 29 breeds described as "vulnerable" and another 11 that are "at watch". The KC list was the result of an evaluation of the recent trends in population size, which for these and many other breeds in both the UK and elsewhere have been falling. They only evaluated the native breeds of England and Ireland, but the data are available to do similar assessments of other breed populations in the UK. The Pharaoh Hound is one of the most critically endangered dog breeds in the UK, with only 13 offspring produced from 3 breeding pairs in 2014. ​Lewis et al (2015) summarize information on population status, genetic diversity, and levels of inbreeding of more than 200 breeds in the UK based on the Kennel Club stud book records. This information can be used to assess vulnerability using some simple guidelines developed by the FAO for domestic mammals and birds. Of the 173 breeds for which I tabulated data, only seven were classed as "not at risk", and these included the six breeds with the highest number of offspring born in 2014 (English Cocker, English Springer, French Bulldog, German Shepherd, Labrador Retriever, and Pug) plus the Chihuahua. Four breeds were classed as "vulnerable" (Border Terrier, Bulldog, Cavalier King Charles Spaniel, and Miniature Schnauzer). Of the remaining breeds, 47 were designated as "endangered", and 115 as "critical". In the graphs below, I have separated the data into the four FAO risk categories and plotted them in alphabetical order with a colored bar along the x-axis (horizontal) to indicate each group (critical = red; endangered = purple; vulnerable = blue; not at risk = green). Note that the y-axis (vertical) is a log scale to accommodate values that range from 5 (Australian Silky Terrier) to 33,157 (Labrador Retriever). I have also indicated the native breeds designated by the UK Kennel Club as either "vulnerable" (yellow highlight) or "at watch" (orange highlight). All of the latter fell within the "critical" risk group. I have also graphed the same data ordered by the number of dogs born in 2014 and with the same colored bars indicating the risk groups. Note again that the y-axis is a log scale. The breeds with the lowest number of offspring fell exclusively into the "critical" category. To give you a sense for the magnitude of the difference in offspring production between critical breeds and those not at risk, I also include the same graph displayed on linear axes. By the FAO criteria, any population with fewer than 100 breeding females is classed as "critical". For the other risk categories, classification depends on the number of sires relative to the number of dams in the seven size classes. ​Here I have graphed the breeds by number of dams and also as the ratio of the number of sires to number of dams. How can we reduce the risk of a breed's extinction? Using the classification system developed by FAO for domestic animal breeds with high reproductive potential, 96% (166) of the breeds in England and Ireland are at risk of extinction. Some breeds might have larger populations in other countries, and that information would be critical to assessing the global status of a breed. However, there is no central source for this information and it will need to be compiled by breed and by country. What is the most effective way for breeders to reduce the vulnerability of a breed? Small populations, regardless of the number of males, are at the highest risk of extinction. Increasing the number of breeding females to greater than 100 in a population that has at least 6 males will reduce risk from critical to endangered. To downgrade to "vulnerable" status, a population needs at least 1,000 dams and more than 20 sires; to be classed as "not at risk", the population must have > 2,000 dams and more than 35 sires. It will be difficult for all but the most popular breeds to achieve the status of "not at risk" using these criteria. Only the Pug, English Cocker Spaniel, and Labrador Retriever recorded more than 2000 dams in 2014. For most of the breeds classed as "critical" in the UK, moving to "endangered" status will require at least doubling the number of females being bred; there are more than 40 breeds for which the number of breeding females is fewer than 20. For most breeds, it will be easier to increase the number of males used for breeding, and this is an important strategy in any case because it will increase the effective population size and reduce the rate of increase in the level of inbreeding. Overall, however, the annual registrations of purebred dogs have been falling over the last decade in both the UK and US. For breeds that already fall in one of the FAO risk categories, this will only make matters worse. Again, the status of breed populations in other countries is essential to understanding the global risk to a breed, and compiling this information should be a priority. It is important for breeders to know the risk status of their breed and take appropriate measures to stabilize population sizes by including more animals in the breeding program. Breeders also need access to the information and expertise necessary to develop strategies for sustainable breeding of both local and global breed populations. Protecting the size and quality of the gene pool will be an essential component of genetic management. Fortunately, breeders have become increasingly aware of the importance of managing inbreeding and the incidence of genetic disorders, and developing breed-wide strategies for genetic management will make both of these things easier. As I have argued elsewhere, dogs need to be added to the list of domestic animal species that are monitored and protected as a valuable genetic resource. From the analysis here that shows most purebred breeds in the UK are at risk of extinction under the FAO criteria, it is evident that this needs to be done very soon. Declining populations, loss of genetic diversity, and the rising incidence of genetic disorders will make genetic management increasingly more difficult. The time to act is now. ​FAO risk status of breeds in the UKRisk status of breeds based on population statistics of dogs from the registry of the UK Kennel Club (Lewis et al 2015). In the last two decades, there has been increased awareness of the value of domestic animal breeds as genetic resources that need to be managed and preserved to ensure their longterm survival and usefulness. The concern for this began when livestock breeding started being done on an industrial scale using modern technologies like embryo transfer and genomic selection. These allowed us to produce millions of nearly-identical animals with the specific production traits (eg., milk, egg production, meat, growth rate) to maximize profits. This happened for agricultural crops as well, resulting in thousands of acres of corn, soybeans, and other crops, all exactly the same height and maturing at exactly the same time. This was great for food production, and these new crop breeds were seen as a boon to food production for our ever-increasing population. Norwegian Lundehund. Photo Arild Espelien. But strong selection for production traits has a down side. Holstein cattle that have been selected for high milk production have low fertility, which of course is a problem if you want to make more Holsteins (Smith et al 2007). And one consequence of embryo transfer technology is that you can produce thousands of genetically identical cows, but when it comes time to breed all you have to work with are siblings. After a generation or two of sibling crosses, production declines, health declines, and entire herds can be ruined. To restore health and vigor to their livestock, breeders can bring in fresh genes from the ancestral stock from which the modern breeds were developed. These old, less productive "heritage" breeds have significant value as a genetic reserve, a living vault containing the genes for hardiness, fertility, disease resistance, and other traits that might be lost under strong selection (Sponenberg and Bixby 2007). With the realization that the global food supply could be at risk if we lose these "heritage breeds" that are needed to restore genetic health to the commercial breeds, the Food and Agriculture Organization of the United Nations (FAO) initiated programs to document the "global animal genetic resources" (AnGR) from which our domestic species of plants and animals were developed. They found that many breeds were at risk of extinction or had already been lost. Some breeds were being replaced by commercial breeds that had little resistance to local diseases and did not do well in parts of the world where high-quality forage was scarce. Other breeds were waning simply because they were less profitable. The declining populations revealed a clear need to protect and preserve the original heritage breeds that were the living reserves of the genetic resources from which our domestic animals and plants have been developed. In response, the FAO has developed information systems to monitor the global status and genetic diversity of populations of these heritage breeds. The centerpiece of the program is the Domestic Animal Diversity Information System (DAD-IS), which continuously assesses the management of genetic resources of domestic breeds in countries around the world. ​Using this information, breeds at risk are identified in the World Watch List for Domestic Animal Diversity (WWL-DAD), and strategies for supporting better genetic management are developed in cooperation with local partners. That these programs are critically needed is evidenced by the statistics: for domestic breeds of both mammals and birds, more than 50% are at risk, and in mammals 13% have already gone extinct. When the programs were set up to monitor the species and breeds that should be considered for protection as genetic resources, the FAO worried about cattle, sheep, horses, chickens, turkeys, ducks, goats, pigs, partridge, ostrich, llama, deer, rabbits, and even buffalo. In many parts of the world, and especially in regions that still rely on the resilient, locally-adapted heritage livestock breeds, dogs are essential for herding, protecting, and managing livestock. Without dogs, protecting valuable animals from predation is done by killing the potential predators. Without dogs, moving the herds of animals the long distances necessary to follow seasonal forage is difficult or impossible. In many parts of the world, the success of animal agriculture depends on dogs. Of course, dogs also have critical jobs in military and police work; they give mobility to the blind and comfort the sick, they detect cancer, drugs, and alien plants; they find the lost and run down poachers, and an endless list of other things. Surely we should be valuing and protecting the dog breeds that have been developed for these specific tasks, as well as the populations of dogs from which all breeds are derived, in the same way that we do the native cattle breeds of Africa, the indigenous poultry in southeast Asia, and even the progenitors of the modern crop plants that feed the world (seeds of which are stored in the "Doomsday vault" in Norway). ​But, for the most part, we are not. The "Doomsday seed vault" in Svalbard, Norway, which stores seeds of the indigenous plants from which our modern domestic crops were developed. One notable exception is an initiative of NordGen in Norway and the Finnish National Animal Genetic Resources Program to protect the indigenous Nordic dog breeds. Most of these breeds have small populations and have gone through multiple bottlenecks, leaving them vulnerable to inbreeding and loss of genetic diversity. The project is a collaboration that includes scientists from Norway, Sweden, Finland, Denmark, and Iceland, working together to assess the genetic health of the breeds, develop programs to restore impoverished gene pools as necessary, and build an infrastructure to support development programs for sustainable breeding. This group, together with the Norwegian Lundehund Club in Norway, has also initiated a program that is racing to rescue the Lundehund from extinction. The Lundehund is an iconic Norwegian breed that was used to hunt for puffins, which were were essential for survival over the cruel northern winters. But when Puffin hunting was banned, the dogs were no longer useful and just more mouths to feed. The population declined, barely survived a distemper outbreak, and finally dwindled to a only a half dozen, mostly related, dogs. A breeding program was started to save the breed from extinction, and all Lundehunds surviving today are descendants of those few dogs. But inbreeding has resulted in high puppy mortality and also a gastrointestinal malady (Lundehund syndrome) that is often fatal. The breed has very small numbers and the lowest genetic diversity of any dog breed (Melis et al 2012). In 2013, the Norwegian Lundehund Club and the scientists involved in the Nordic dog breed program drafted a plan to outcross the Lundehund with the goals of preserving as much of the existing gene pool as possible and adding genetic diversity that would improve health and reproduction. So far, five breedings have resulted in only two litters and a total of eight puppies, so the battle to save this breed will clearly be uphill. But the effort has begun, and none to soon. ​Is this a breed worth protecting? The Norwegians and the scientists certainly think so. How many other breeds of dogs are sliding down the slippery slope towards extinction as a result of small population size, inbreeding, and genetic disease? We don't really know. The UK Kennel Club has created a list of the UK's vulnerable native breeds based on their stud books, but no action is being taken to protect the gene pools of these breeds. Their fates lie in the hands of breeders that lack the expertise and resources to do any sort of genetic management at the population level. Outside of the UK, there are a few breeds in other countries receiving protection such as the Donggyeong in Korea and the Chongqing dog in China. But there are no global or even regional assessments of the status of the vast majority of breeds around the world, which number over 1,000 if you include the many (mostly working) breeds not recognized by a kennel club (Morris 2001). Should we be worrying about preservation of dog breeds? Are these breeds of dog really important? I think we can argue that many are. In Mongolia, for example, the nomadic herders have relied for thousands of years on an indigenous mastiff, the Bankhar, for protection of their families and livestock from wolves and leopards. These dogs are well-adapted to the harsh terrain and climate, and they have the strength and temperament to be effective deterrents to the wolves and snow leopards that would prey on livestock. A female Bankhar, protecting the livestock, the children, and even the stuffed animal. ​Unfortunately, the Bankhar dog was nearly wiped out during the Russian occupation of Mongolia, and shooting the predators became the only means of protecting livestock. Removal of predators has ripple effects that alter many aspects of an ecosystem - the populations of other prey animals, the vegetation, and the many complex interactions of plant, animals, and environment. In some areas, extirpation of predators eliminated the need for livestock guarding dogs. As a result, the traditional livestock guarding dogs declined and in some cases have become extinct. The Dalbo dog, for example, protected livestock in the forests of Scandinavia for centuries, but elimination of the predators during the 1800s reduced the need for the dog and by 1913 it was extinct. But now in many places the success of programs to protect and restore populations of wolves, bears, and other predators is once again increasing the predation on livestock. The inevitable conflicts are pitting ranchers against wildlife managers, and we are slowly coming to the realization that, in many cases, the ancient, traditional livestock guarding dog can enable livestock and predators to coexist. In Bulgaria, for example, conflict between shepherds and conservationists over ways to reduce predation on livestock led to the creation of an organization called Semperviva, which is breeding the traditional Karakachan dogs and providing puppies to the shepherds. ​Similarly, a group in Slovenia has formed a non-profit to support a genetically sound breeding program for the Karst Shepherd, which is an FCI recognized breed but suffers from inbreeding and a small population size. Daniyar Daukey, who has started a breeding program for the Tobet in Kazakhstan. Even private citizens have taken the initiative to start breeding programs for breeds in danger of extinction. Daniyar Daukey has started a breeding program for the Tobet in Kazakhstan. There are many examples of breeds that have declined or gone extinct. Among the sheep-herding breeds, for example, there is the Cevennes Shepherd of France, which was once recognized by the FCI but has become so rare that it is no longer listed. Of the four indigenous sheep-herding breeds of Wales, two are probably extinct (the Welsh Black-and-Tan Sheepdog and the Old Welsh Grey) and two are very near extinction if not already gone (the Welsh Hillman and Welsh Blue-Grey) (Morris 2001). In Asia, the Dhangari dog of India, which was used for both herding and hunting, is only one of a number of indigenous breeds in danger extinction. Among the others are sighthounds (Kaikadi, Taji, Chippipaparai dog, Soriala Greyhound), mastiffs (Alangu and Himalayan mastiff), and herders (Maharashtrian Shepherd Dog). We could go on and on, listing breeds that are still doing the task they were bred for, others that have gone extinct when the need for the dog declined, and many that have lost their historic job but remain as pets and companions. Many of the terriers fall into this last category. No longer used for vermin control, they were found to be suitable as lap-sized companions. But strong selection and inbreeding have taken a toll on health, and declining numbers now threaten many of these breeds with extinction even as they remain popular as pets. Many terriers populate the UK Kennel Club's vulnerable breeds list, but with no plan to restore genetic diversity and reduce the incidence of genetic disorders, the future of many of these breeds looks grim. Perhaps our greatest concern should be for the breeds that modern molecular genetics is identifying as some of the most ancient. Two landrace breeds, the Basenji and the Canaan dog, are the oldest of the extant dog breeds (yellow arrow in figure opposite). Both have become recognized as "purebred" dogs and have loyal followings among breeders. But the purebred populations suffer from low genetic diversity, and acquiring more dogs from the countries of origin is difficult. In the Congo, which is the central African home of the Basenji, war and civil unrest make it too risky for trips to collect new dogs to add to the registered population. And in the Negev where the Canaan dog is found, a decline in the number of Bedouin herders, as well as programs to eliminate dogs for rabies control, is making it more and more difficult to find dogs. How "valuable" are dog breeds? It does seem that, for a variety of reasons, we should be worrying about the long-term survival of many of the dog breeds of the world. But investment of resources in programs to prevent extinction must be motivated by criteria of value and loss. ​If we lose a breed here and there, how much does it matter? Is one breed more valuable than another, and how would you judge? If the job is extinct should we be saving the breed? These questions become much more difficult to answer if we recognize that we really know very little about what dogs are capable of doing. A dog that can detect the presence of cancer in a urine sample better than any existing technology has value to medicine that is difficult to estimate. Dogs can detect drugs hidden in cargo, they can find a fire ant in a field, and they can locate an invasive plant species hiding among native plants. Dogs can detect magnetic waves, they can read our facial expressions, and they can sense an imminent hypoglycemic crisis. Dogs trained to lie perfectly still in a MRI scanner are even contributing to a better understanding of the workings of the brain. And then there's the huge role they are beginning to play in genetics research. Shannon et al 2015. Genetic structure in village dogs reveals a Central Asian domestication origin. PNAS. Since the sequencing of the canine genome, an explosion of research has revealed that dogs are a model animal for the study of genetic disorders in humans. Not only are they afflicted with many of the same disorders, but identifying the mutations involved is much easier to do in dogs. The potential for significant discoveries is huge. Of the 663 genetic traits and disorders identified to date in dogs, more than half (367) have potential to serve as models for human disease (Online Mendelian Inheritance In Animals; as of April 2016). One of the reasons purebred dogs have proven so useful in genetic studies is because they are so inbred. Generations of selective breeding in closed populations has resulted in the accumulation of deleterious alleles. Related dogs are likely to share some of the same mutations, so inbreeding increases the expression of recessive mutations. The overuse of popular sires has distributed what should be rare mutations widely in breed populations, producing large numbers of animals in a breed that are afflicted with a particular disorder. This makes the offending genes relatively easy to identify with only a small number of test subjects. Because of selective breeding for specific phenotypes, it is likely that dog breeds will differ genetically in ways that could facilitate research of traits that would be otherwise difficult to study such as behavior, evolutionary adaptations to extreme environments, epigenetic processes, and the influence of the intestinal microbiome on disease and immunity. But really, we have no idea what the limits are of what we can learn from them. Where would we be without dogs? It's difficult to imagine, even without allowing for the amazing things we could learn from them in the future. But we haven't been thinking about them as having "genetic value", as a resource that we should be managing and protecting like other natural resources. There is no information about the genetic status of most breeds of dogs, registered or not. We don't know population sizes, geographic distribution, genetic diversity, or even which breeds still exist and which have already gone extinct. There is no summary list of breeding programs and preservation efforts, and no organization tasked with any sort of monitoring program. Even many of the breeds we are most familiar with, and which might seem to have abundant numbers, would be classed as threatened or endangered using the criteria for other domestic animal breeds. The FAO has developed a simple table for breeds of "high reproductive capacity" (i.e., produce litters of offspring versus only one or two at a time). Knowing the number of breeding males and females in the population, a breed can be assigned to a risk category. Done on a country-by-country basis, as is for other domestic animals, many breeds of dogs are going to find themselves in the danger zone. There is no animal on earth with greater diversity in morphology, behavior, and the roles it plays in our lives. Certainly there is none that has played a more significant role in the development of human civilization. The value of the dog to us as an "animal genetic resource" is inestimable. There are more than 400 recognized pure breed of dogs, and hundreds more that are not formally recognized but are essential as working dogs. Then there are the populations of village dogs around the world. These are not mixed breed, feral dogs, but animals that have been free-living in the vicinity of human populations for thousands of years. They carry the signatures of genetic ancestry that are now being used to piece together the evolutionary history of both dogs and humans, including where the first dogs were domesticated (Larson and Burger 2013). We should be treating dogs like the invaluable resource they are. We need to preserve not just the animals but also their gene pools, including those of land races, ancestral breeds, and village dogs that are the living reservoirs of canine genetic diversity. We need to document the breeds of the world and their current population sizes and genetic status, and we need to create the kinds of monitoring and development programs already in place for other domestic breeds of importance. We need to train breeders in the methods of sustainable breeding and provide them with the expertise and tools they need to be "preservation breeders". We will need scientific expertise, computer and database technology, the cooperation of thousands of breeders around the world, and funding. Instead of breeding for perfection and purity, the most important - and urgent - consideration of breeders should be preservation. The loss of genetic diversity over time can be insidious, and genetic rehabilitation or restoration of a breed is difficult. Breeders reluctant to make the best use of genetic diversity existing in a breed because it involves using less than spectacular animals will find it infinitely more difficult to consider a genetic rescue that will require crossing to another breed. Genetic management for breed preservation will require breeders to take a long view that considers the potential consequences of today's decisions on the breed generations down the road. It will require cooperation and transparency among breeders on both a regional and global scale. It will require educating breeders and finding appropriate rewards for good genetic management instead of ribbons for success in the ring. There are hundreds of dog breeds. This is going to require a serious and substantial commitment. But dogs are amazing, and the payoff is likely to be huge. It will be a great investment in our oldest friend. Boyko RH & AR Boyko. 2014. Dog conservation and the population genetic structure of dogs. Free-ranging Dogs and Wildlife Conservation; Oxford Univ. Press. Dobson H, RF Smith, MD Royal, CH Knight, and IM Sheldon. 2007. The high producing dairy cow and its reproductive performance. Domest. Anim. 42 (Suppl 2): 17-23. Larson G and J Burger. 2013. A population genetics view of animal domestication. Trends in Genetics 29(4): 197-205. Melis C, AA Borg, IS Espelien, & H Jensen. 2012. Low neutral genetic variability in a specialist puffin hunter: the Norwegian Lundehund. Anim. Gen. 44: 348-351. ​Morris D. 2001. Dogs: the ultimate dictionary of over 1,000 dog breeds. Trafalgar Square, North Pomfret, Vermont. Shannon, LM, RH Boyko, M Castelhano, E Corey, JJ Hayward, and others. 2015. Genetic structure in village dogs reveals a Central Asian domestication origin. PNAS. Sponenberg DP and DE Bixby. 2007. Managing breeds for a secure future: strategies for breeders and breed associations. The American Livestock Breeds Conservancy, Pittsboro, North Carolina.